So I just started grad school yesterday at Mason. My Exercise, Fitness, and Health Promotion courses consist of a sports nutrition, sports psychology and a women's studies class on bodies and borders. Last night, my nutrition teacher went batty about a website I absolutely love. Livestrong.com, or Lance Armstrong's website has joined powers with The Daily Plate to make a mega site completely up my alley. On this site, you can track almost anything you eat. I'm talking specifics. For example, if you eat a Big Mac from McDonalds, it's on there. If you make a recipe from the Cooking Light cook book, it's on there. And, the best part of all, if it's not on there, you can add it yourselves. Just make your own recipes consisting of the foods on the site and you've got a perfectly simple one click away tracking device that keeps you honest. I've recently (well, over the holidays and with my new strength training) gained about 10 pounds. Maybe a little less, and definitely a lot of muscle mass but still! I don't want to start the downward spiral of weight gain--especially now, when my metabolism is the highest! So, I'm challenging myself to stick to my guns on this one, and instead of taking foods out and putting foods in, I'm going to a make/break one new habit a week. This week, I'm tracking all of my food. Yes, every morsel. If one almond, three carrots and a sip of milk go into my body, I'm tracking it. So, I've "snipped" my page for today for you to see. My calorie goal on the site is 1600. Personally, I think this is low and I'll be hungry, I'm sure, but like I said, I'm not worried about the calories--just TRACKING! The cool thing about Livestrong.com is you can make goals, and it will customize how much you should be eating depending on what those goals are. So I added that too. But, you'll see from this that if all goes to plan, I'm within the 1600 calorie goal. It seems like a lot of food, and it is, but it's healthy food, and it's going to fuel my long days. 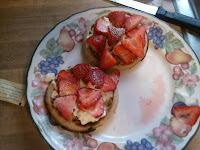 As you can see, I had a good breakfast of whole wheat waffles, cottage cheese, strawberries and lite syrup. 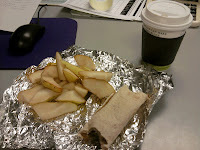 Lunch was a whole wheat turkey wrap with avocado and sour cream with a pear and some coffee. Throughout the day, I had pretzels with mustard, an activia light and almonds to keep me fueled until dinner. Dinner was a 5-cheese lasagna lean cuisine with parmesan, and frozen vegetables. My new jump off ice cream is Edy's Slow Churn half the fat Thin Mint Cookie!!! So good. I think that's it. It's only 2:31 but if anything is added onto the menu I'll be sure to update.